Digital vector painter. Started around 1998 with watercolor, linocut and monotype of etching ground on glass. Changed to digital painting on a Palm handheld in 2004, initially raster. Proceeded through a combination of raster-vector to vector around 2014. Lorenzo Award for digital painting at the 2015 Florence Biennale, several other awards. Author of 'Digital painting explained and illustrated, (2013-2019)', an online source of information on digital painting. I am exploring the new medium of vector. My work develops in cycles from figurative to abstract and back to figurative. Hard lines, monochrome colors and perfect gradients limit the emotional palette of vector. 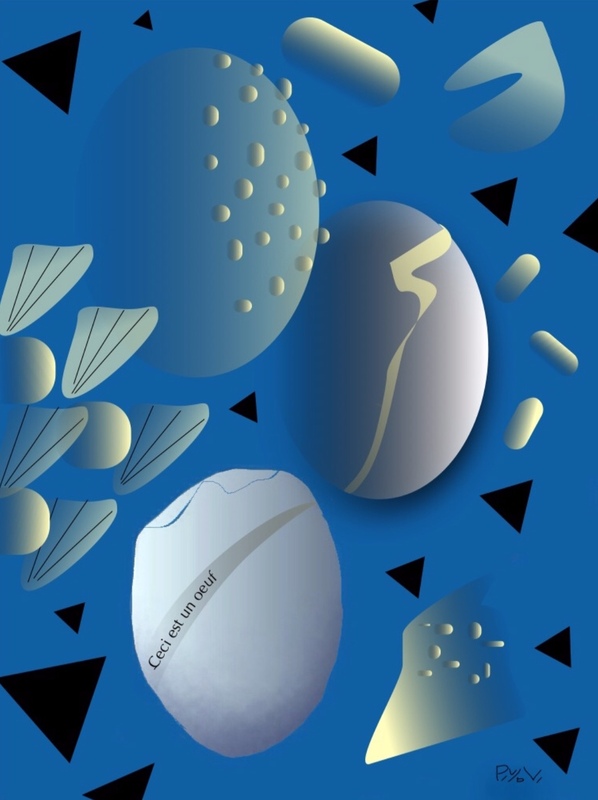 ‘Ceci est un oeuf’ (2015, below) expresses my initial dislike. Still, I hold manual vector to be the only cooperation between the artist and the computer that offers a new language of form while leaving the artist in charge. On one side there is digital raster painting, where the artist is fully in charge but forms are in no way different from traditional painting. On the other, computer generated painting offers renewal, but the computer takes the lead. Its perfect forms, regularity and repetitiveness, and the absence of the artist's particular brand of clumsiness feels to me emotionally void. I proceeded with manual vector for the pleasure to experiment as well as for a practical reason: it relieved me from the enlargement of raster paintings which is always a tedious and noncreative work. To overcome my dislike I searched for ways that could lend vector some of the soft nuance and broader range of expression of raster. Restricting color to black-and-white gradients, supplemented with one or two monochromes achieved that. Through these clair obscurs I became more or less comfortable with vector, especially with the latest works: Waiting, Diner, Thoughts, Rainy day, Woman. From then on I have been painting in monochrome and gradient colors. Still looking for ways to soften and deepen manual vector, I recently started to use Mandelbrot and L-systems fractal forms as a background, and to combine manual vector with photo transformations.